così quel fiato li spiriti mali. so does that blast propel the wicked spirits. Dante’s lines recall some of the most famous birds in Florence. 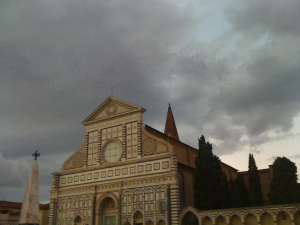 As many visitors to the city know, each day around dusk flocks of starlings descend on the gardens of the majestic Basilica of Santa Maria Novella, not far from the not-so-majestic Fascist-era train station and its subterranean shopping malls.